Two entrepreneurs from Siberia have found that the demand for goods made in Russia is increasing interest in their storage system. Two young entrepreneurs from the Siberian city of Omsk (1,400 miles from Moscow) are attempting to mount a challenge to IBM and Intel with a new computer server that is more energy-efficient than the models currently available in the global marketplace. In addition to the product’s technical benefits, some local buyers like the fact that the storage system is Russian-made. Maxim Koposov and Evgeny Teplyakov built their first server in 2010 out of scrap material. Based on the American Backblaze cloud storage system, it took the entrepreneurs three months to build. They sold the first model of their server, called BitBlaze, to an online video site in Omsk at the end of 2010. The server, which is equipped with an Intel processor, is cheaper than similar products. The price ranges from 189,000 rubles ($3,100) for the most basic model to 394,000 rubles ($6,500) for the most advanced. According to Koposov, the key benefit of the BitBlaze server is in its efficiency. "Our knowhow consists in assembling standard details and the balanced efficiency of the cooling and power systems," Koposov said. According to Koposov, the BitBlaze-60 system's energy consumption is 13 percent lower than that of its competitors, while the higher density of the disk assembly helps guarantee a cost of almost 40 percent lower than that of the market leaders. 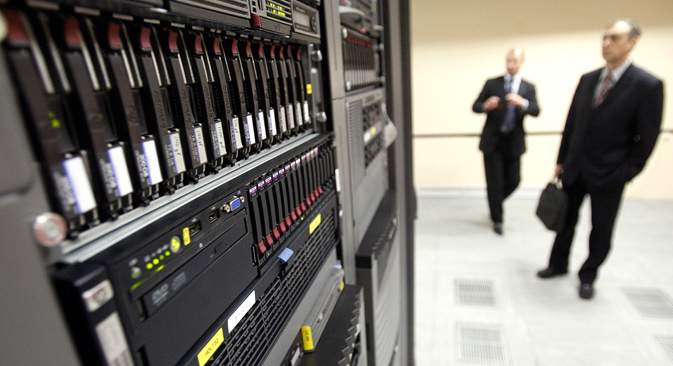 The demand for better servers is growing, according to forecasts from the International Data Corporation (IDC). IDC numbers show that the quantity of information on the planet will at least double every two years. Research from another firm in the sector, Gartner, shows that the annual cost of information storage services will increase to $34 billion by 2016. The Russian segment of this market is still relatively small – it totaled only 26 billion rubles at the end of 2013 (about $800 million in that year's exchange rate), and American firms dominate. The market leader is EMC Corporation with 37.1 percent of all servers used in Russia, but HP, IBM and HDS also have strong positions. Russian developers – a total of about 20 companies – occupy five percent of the market, according to IDC Russia analyst Mikhail Popov. Koposov and Teplyakov started actively promoting their company, Promobit, at industry fairs, giving potential buyers the option to try their servers. In 2013 they sold 30 information storage systems, and in 2014 - another 60. Evgeny Kurin, the general director of Geolab IT, which specializes in the interpretation of seismic information, is a BitBlaze convert. "It was necessary to create a backup information storage system containing bigger capacity with specific demands, and the solutions we had were just not good enough," Kurin said. "We chose BitBlaze because of its high density in information storage, its energy efficiency and its flexible system settings." Promobit was also able to agree to have its servers tested by Russia’s giant Internet firm Mail.Ru Group. Gulnara Bikkulova, director of the Innovation Markets Department at the Russian Venture Company said that BitBlaze has found an important niche: "Such storage systems help save on costly information processing platforms and reduce the cost of finalized solutions." In the summer of 2014 the company created a server with the Russian Elbus processor, and now Koposov and Teplyakov hope that the demand for servers based on the Russian processor will increase among state agencies. "The import substitution trend is beneficial for us," said Teplyakov. "As is the general growth of generated and stored information, including the simple increase in video and photo content quality provided by the users." He said that negotiations to test BitBlaze are taking place with truck maker KamAZ and oil major Gazprom. Sergei Razumovsky, the executive director of software firm Raidix, said that BitBlaze can become one of the key elements in building storage systems based entirely on Russian components. "In times when there are restrictions on defense enterprises buying foreign information storage systems, the Promobit solution is very relevant, since it provides a necessary alternative," said Eduard Adamyan, General Director of the Kama Flow Foundation, which has already invested $200,000 in the project. This text originally appeared in Russian at RBC Daily.